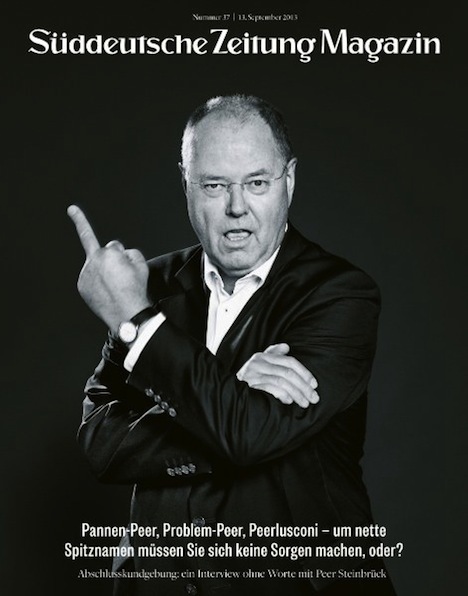 That’s not a photoshopped image — it’s really the center-left chancellor candidate Peer Steinbrück giving the bird to an interviewer! For Steinbrück’s spokesman Rolf Kleine, it was apparently “a little too spontaneous,” according to the paper. So what question prompted the candidate to give what German’s call the “stink finger”? To be fair, the question was a bit obnoxious — and if this been in the middle of a bar and not in the middle of a campaign in which the man in question is trying to become a major global leader, it might not raise any eyebrows. It’s a bit base, but also very funny — defiantly so. Here it goes: “Gaffe Peer, Problem Peer, Peerlusconi — you don’t have to worry about being given any nice nicknames, do you?” The question was a reference to gaffes made by the candidate early on in the campaign. But at the end of a nearly yearlong campaign, voters prefer chancellor Angela Merkel by a nearly 2-to-1 margin in polls and Merkel’s center-right Christlich Demokratische Union (Christian Democratic Union) has consistently led Steinbrück’s Sozialdemokratische Partei Deutschlands (SPD, the Social Democratic Party) by double digits all year long, you’d be excused if wondering whether Steinbrück feels like flipping the bird to the entire German electorate. Voters go to the polls on September 22 to select the members of Germany’s lower house of parliament, the Bundestag. Photo credit to Alfred Steffen/SZ-Magazin/dpa. Andalusia, the most populous of Spain’s ‘autonomous communities,’ has one of the most distinctive cultures in Europe — it’s the home of flamenco musical tradition, the Moorish architecture of Córdoba and Granada, the Baroque splendor of Seville and the birthplace of sherry. For all of its cultural riches, however, Andalusia has recently distinguished itself as one of the most economically challenged regions in Europe. Last year, it had the second-highest unemployment rate (34.6%) in the entire European Union, with a youth unemployment rate of over 60%. When you think of the European periphery that’s been choked off from economic growth by the eurozone sovereign debt crisis and the European Central Bank’s monetary policy, you should think of Andalusia. Enter Susana Díaz, who took over last week as Andalusia’s new president (and its first female president), following the resignation of José Antonio Griñán, who had served as the Andalusian president since April 2009 and led the Partido Socialista Obrero Español (PSOE, Spanish Socialist Worker’s Party) to a nearly historic defeat in what’s long been a heartland of the Spanish left, stemming from the stridently leftist response to the latifundio culture that dominated economic life in the region through the early 20th century. The lack of political competition in the region has done Andalusian residents few favors, however, and Socialist bosses control the region’s government as surely as the caciques of the old aristocracy. Díaz marks somewhat of a break from the immediate past (up to a point) — from Griñán, and also from his predecessor, Manuel Chaves, who served as the Andalusian president from 1990 until 2009. That’s good news in light of ongoing investigations into corrupt practices of past governments because past Socialist officials, including potentially Chaves and Griñán, are implicated in the fraudulent diversion of funds from ERE, a publicly subsidized fund that pays severance to laid-off workers. Griñán announced he wouldn’t run for reelection as leader of the Andalusian Socialists earlier this year in part to shield the Socialist government from being further soiled by the ‘EREgate’ investigations. Díaz won the leadership easily in July as Griñán’s preferred candidate, despite the promise of a robust party primary, and Spain’s national Socialist leader Alfredo Pérez Rubalcaba worked to hasten the transition to Díaz, given the ethics cloud hanging over Griñán and Chaves. It’s become somewhat standard practice for Andalusian Socialist presidents to stand down between elections, however, allowing new leaders the benefits of incumbency in advance of the next election. For Díaz, that won’t likely come until 2016. Though it’s not yet clear whether Díaz marks a true rupture from the old Socialist bosses that have controlled the Andalusian government for three decades, she has a long and difficult road of governance ahead. Somewhat promisingly, Díaz has already replaced three of the eight leading ministers in the Andalusian government, including the top economic officials from the Chaves-Griñán era and appointed her own economic team — headed by Andalusia’s new economics commissioner José Sánchez Maldonado, a former professor of public finances and a Socialist heavyweight who hopes to emphasize employment, growth and social justice. But just ask Sicilian president Rosario Crocetta how much leverage he has had in repairing another struggling peripheral Mediterranean economy, even with all the anti-corruption, pro-growth, pro-employment sentiment he can muster. Frankly, Díaz holds few of the political and economic levers that would allow her to radically change Andalusia’s destiny, which will be determined to a larger degree in Berlin, Brussels and Madrid than in Seville. 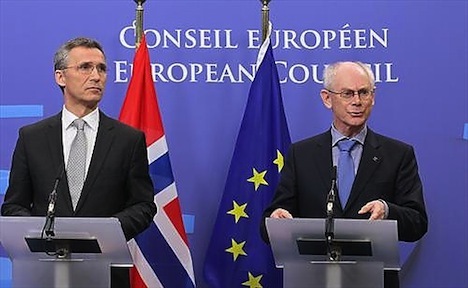 Last autumn, the region requested an additional €1 billion to meet its financial obligations, and the government has long been suspected of hiding the true extent of its debt obligations from federal officials.